Posted by We started off our walking tour of Frankfurt by fueling up at the best (award 2013) bakery in Germany - Bäckerei HansS (see previous post with bakery goodies here), continued on with the top Aldstalt (Old Town) sites, churches and Frankfruters (see previous post with what to look for, do and eat), hit up Frankfurt's largest indoor farmer's market: Kleinmarkthalle (see the delicious sausages and eats and more sites here)... and after navigating thru their train, metro and bus system, we rested at the hotel for a bit and then headed off to try out a Apfelwein (apple wine) house! The bus dropped us off close to the River Main, and we had a nice picturesque walk to the restaurant. 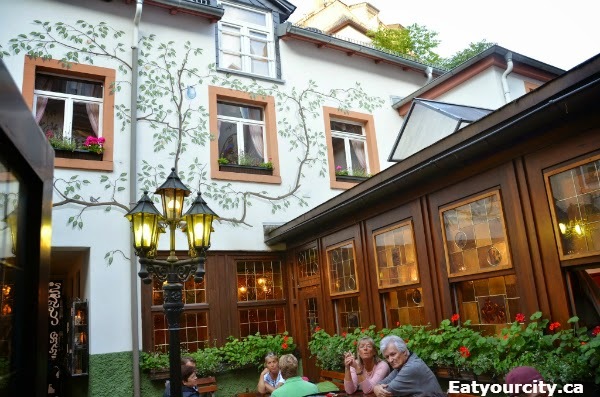 We originally were planning on hitting up Apfelwein Wagner - a Apfelwein house that's supposedly the oldest in town despite recent reviews of travellers and locals alike commenting on discourtesy and poor service. 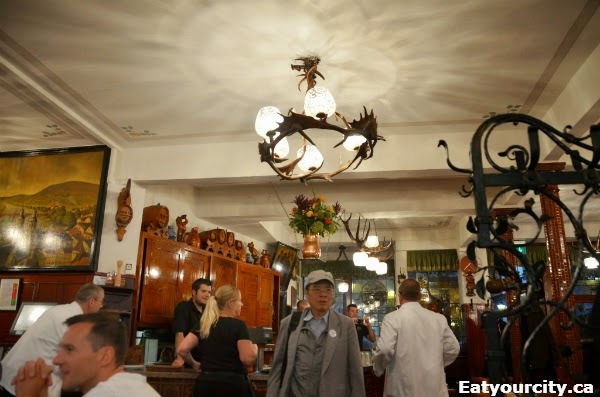 In Germany, at bars, pubs or restaurants like Apfelwein houses, unlike most of Europe and North America, you don't wait by the door to get seated.. you find a table or ask to join a table and sit yourself down, or you'll be waiting till the cows come home. Familiar with this, we set out to find a table in the various dining rooms they had, but left after we poked our noses into a dining room and were told by a kitchen staffer who was sitting at one of the tables conversing with the customers "Go - no room" and waving his hands... despite it being clear there were free tables with no reserve sign, and other already seated customers looking shocked. 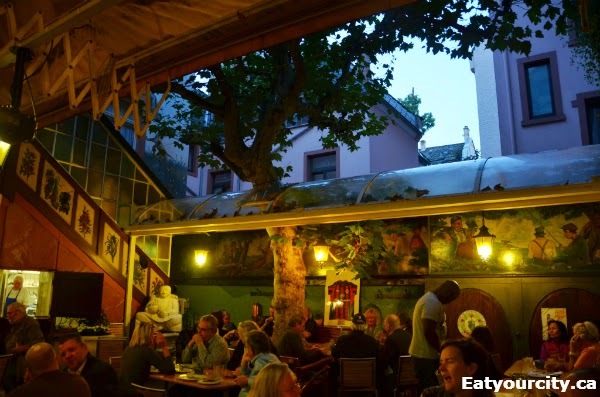 Well, no big deal - we left and went with what the locals enjoy as their new favorite and friendly Apfelwein house in town... Zum Gemalten Haus or "Painted House", which conveniently located right next door! 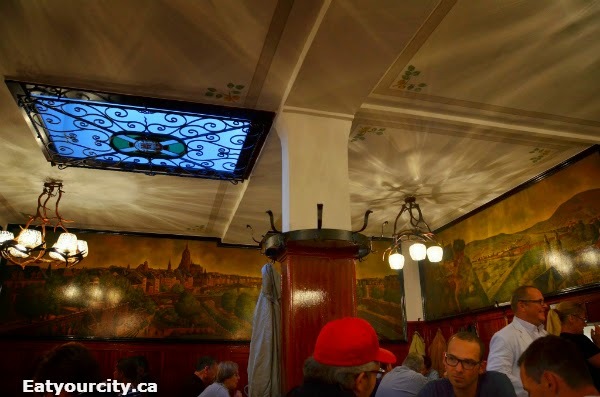 We headed in deeper to Zum Gemalten Haus - they had a charming old school mural on the walls of the dining areas too! a cheerful brass? sculpture by the bar all add to the charm of this busy packed place! A very busy busy bar... don't think the bartender even had time to blink as he was just flying pouring endless rounds of Apfelwein, shots, cocktails and more Apfelwein all night. Since we looked like tourists, we had at least two waiters and waitresses tell us to "sit anywhere!" 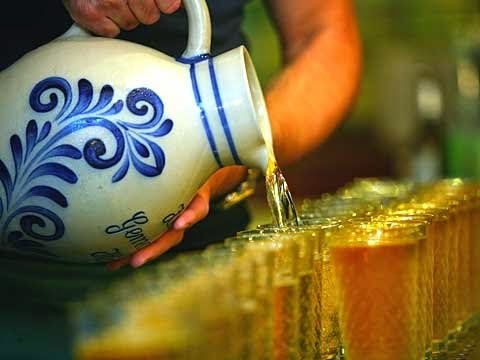 as they hurried past with mugs of aprelwein and savory smelling plates of food. So in no time, we found a spot and joined up with two couples that were already sharing a table others with waves and smiles overcoming the language barrier. Our waiter was efficient, friendly and somehow managed to sneak in a joke or two while running around taking orders, food and drink to and from several dining areas. 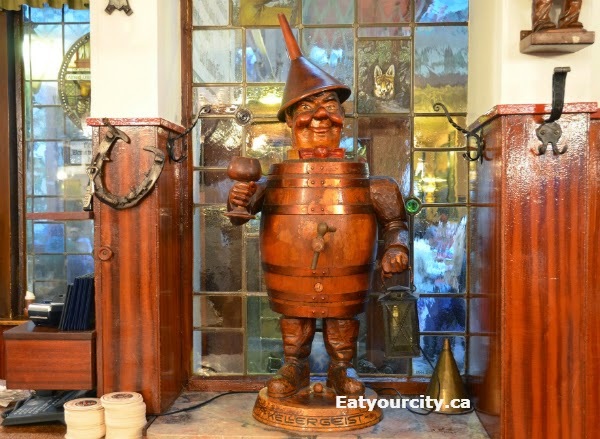 If you are in a large party, the Apfelwein is served in a traditional pot bellied bembel and sparkling water is provided for you to dilute the cider. Since we weren't ordering it by the pitcher as it was just the two of us, our glasses of Apfelwein is premixed at the bar into glasses. 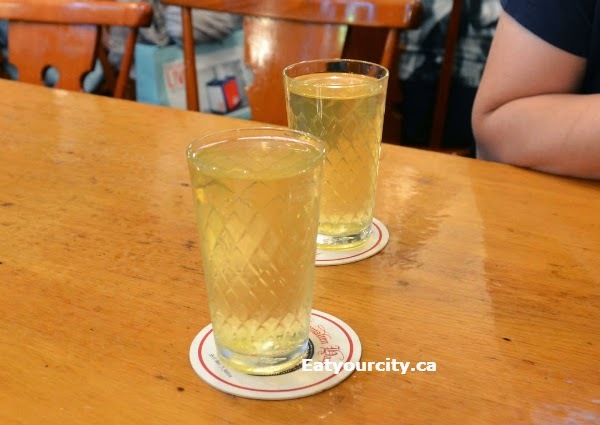 It's a mild tasting, smooth apple cider with subtle sweet notes and just enough acidity to give it a refreshing finish. The cups are diamond patterned traditionally - in the past, no utlensils were used = greasy hands, so you didn't want to accidently drop your pint! 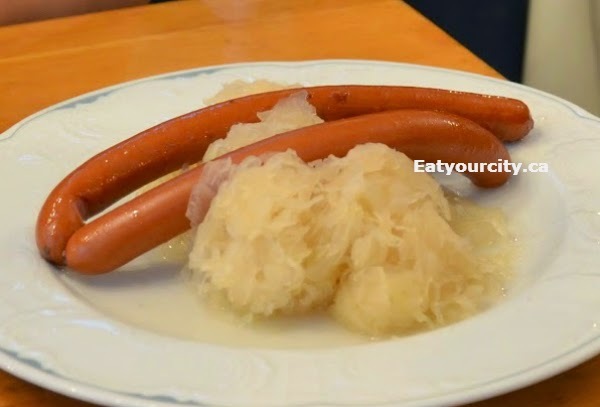 and the Frankfurters were excellent - the casing had a delightful snap when you bit into them, and the sausage itself was juicy and flavorful. 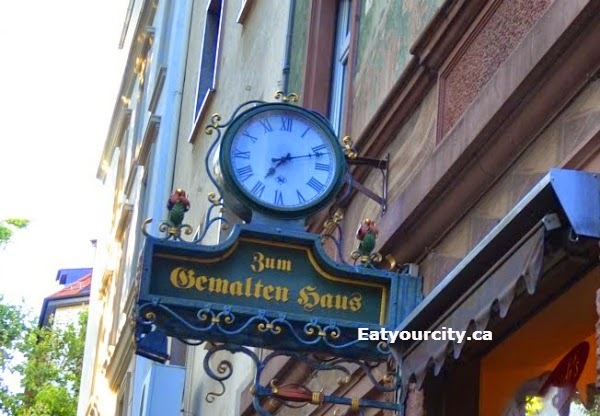 We had it with lots of the sweet Senf mustard or German mustard... our waiter told us they source theirs from a mustard speciality shop a few blocks away, but we weren't able to hit it up after supper before they closed... next time! The Rindersolber mit Grüner Soße or Beef shoulder blade with Green Sauce. 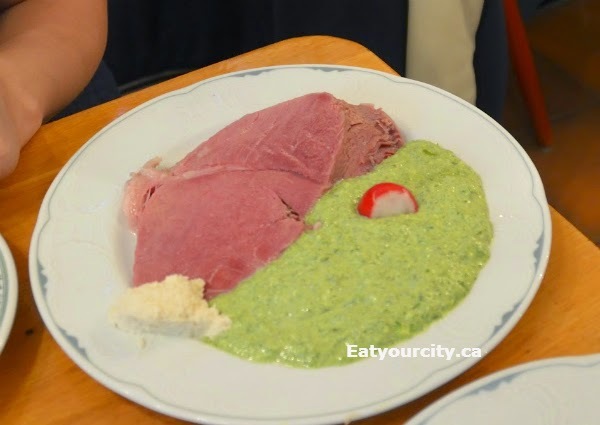 The beef was lightly salted and almost had the texture of a good baked ham and was served with a traditional green sauce - usually a base of sour cream, hard-boiled eggs, oil, vinegar, salt, a whackload of 7 fresh herbs: parsley, cress, chives, borage, salad burnet, sorrel, and chervil. It makes for a strangely refreshing herbal sauce that grows on you as you eat it.. I was eating it straight like soup towards the end lol! And got a couple thumbs up from other customers as they saw me enjoy the green sauce with gutso! 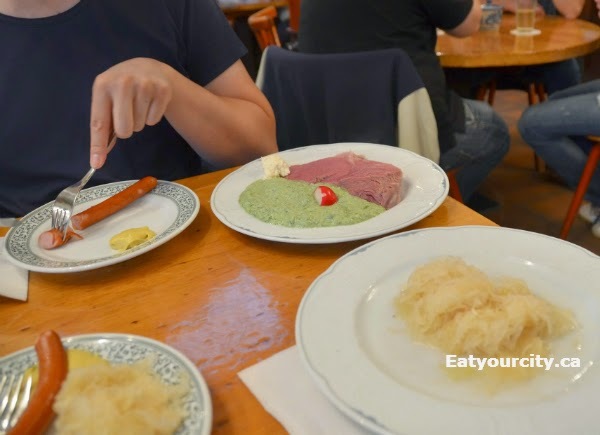 Somehow, we must have ordered an extra side of sauerkraut somewhere in there or it came as a side dish with something. It had nicely balanced flavors of sweet, salty and had a nice al-dente texture.. yum! 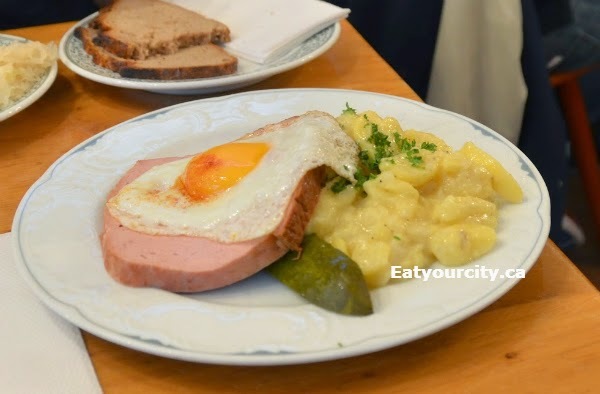 The Fleischkäse mit Ei und Kartoffelsalat or German style meat loaf with egg and potato salad wasn't a meatloaf in the North American sense with a slice of seasoned ground beef and gravy. 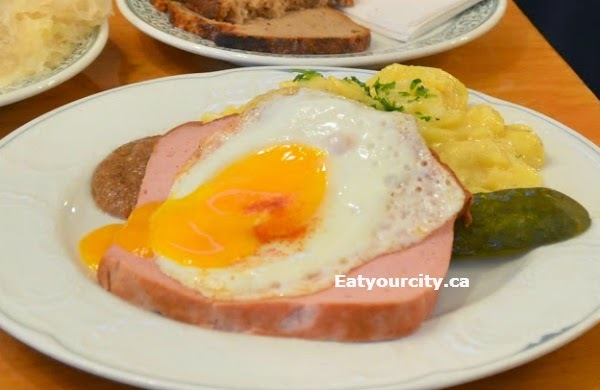 German style meatloaf is closer to a gigantic slice of bologna. It was served with a perfectly cooked over easy egg sprinkled with paprika and delicious potato salad... and super tasty pickle! 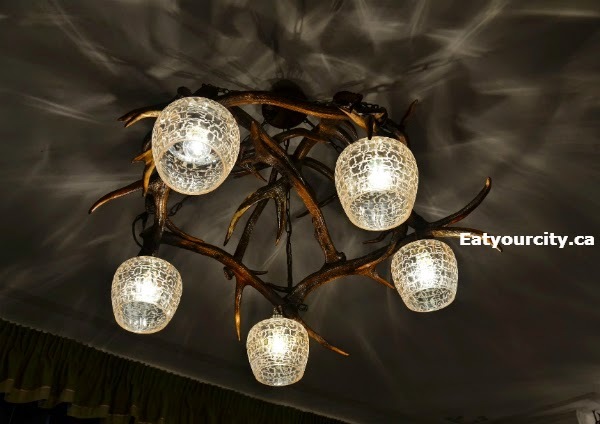 It was like eating a wonderful breakfast at dinner, especially with that glorious runny egg yolk. Too full for dessert, we almost had to roll out the door, admired the murals at night on the way out and rather than taking the bus, we had a nice walk on the river, happened upon an outdoor concert and then strolled our way back to our hotel on our first and last night in Frankfurt.